It has been quite mild here, if a little wet. However, today, the sun was shining and it looked a perfect day for a spot of bird-watching. I walked to Baron's Haugh and caught up with a few of my birding friends who were in the Marsh hide. There was not much to see from this hide, so we decided to go to the next one - the Causeway hide. 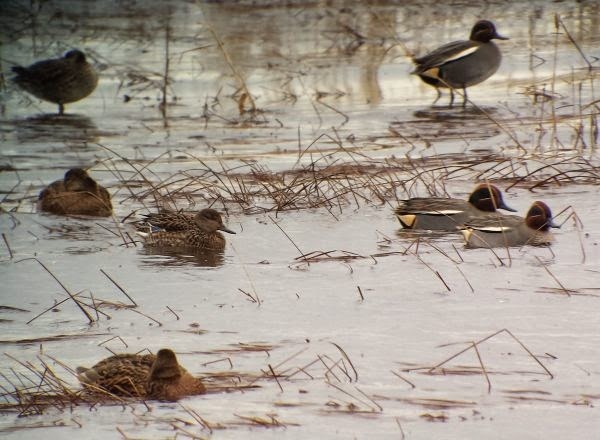 This was much better as there were a lot more birds to see, including a large number of Teals. Unfortunately, the sun disappeared behind some dark clouds and the light became quite poor. A couple from Linlithgow were visiting for the first time today and were impressed with the numbers of birds in the area. They had been at Loch Leven the day before and were wrapping up the long Christmas break with a visit to Motherwell. Below are some photographs I took through my scope, although the poor light has not been strong enough to bring out the nice colours of the birds. Click on them to enlarge. 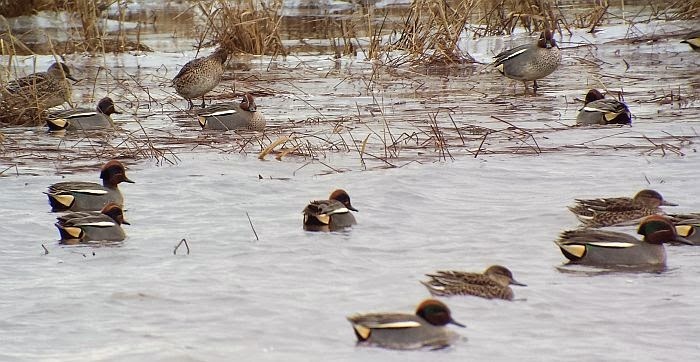 Teals are small dabbling ducks. The Males have chestnut coloured heads with broad green eye-patches, while the females are mottled brown. 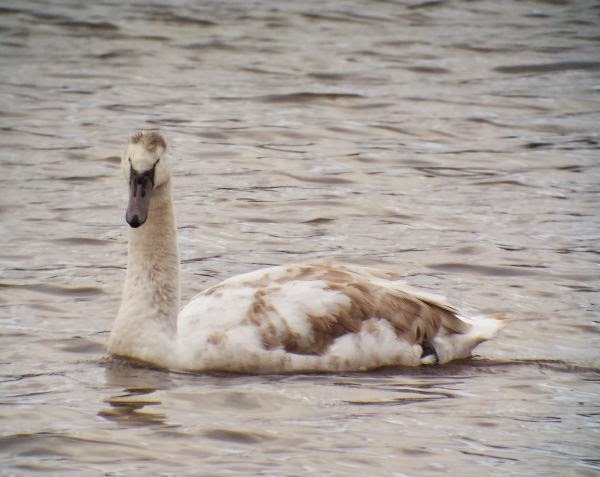 In winter they congregate in wetlands and many have come from the Baltic and Siberia. 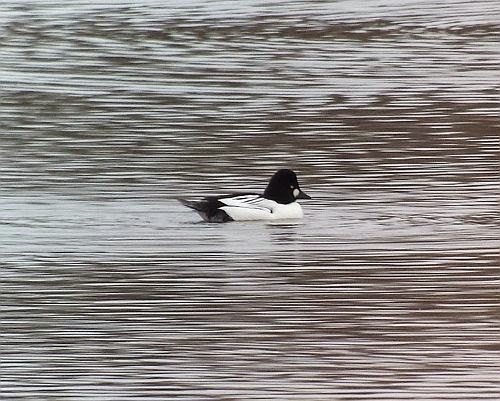 Goldeneye are winter visitors. The males have a dark green head with a distinctive white circle under the eyes. The females have a brown head. The bird above was by itself and there were no other Goldeneye with him. In Springtime we watched the adult swans building their nest and the bird above has successfully reached its first winter. It still has some of the dull juvenile feathers remaining, but they will soon be replaced by white ones. The beak is still a grey colour and it will soon become a bright orange one. 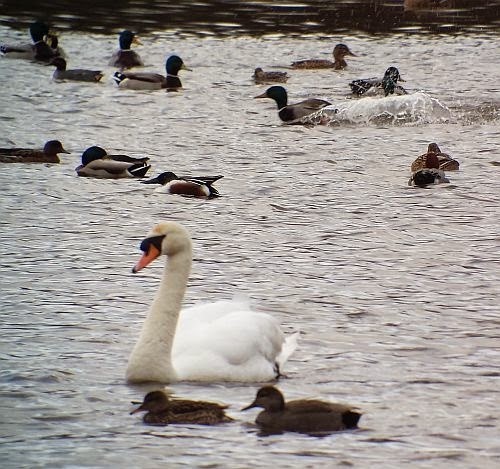 In the picture above, the mute swan has a pair of Gadwall in front of him and just above his head with the brown and white wings is a Shoveller. By about 2.00pm the light was fading fast so it was time to call it a day and go home.